It didn’t take long! 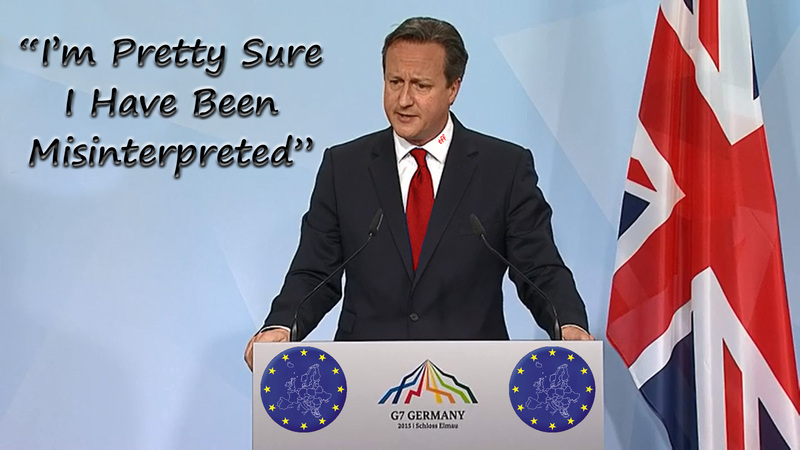 Already Dodgy-Dave has called up the tried and tested defence bettered only be “I was on holiday at the time”. He has denied saying ministers will be forced to back him in the EU referendum or quit their jobs. A quick check with Lynton and Dodgy ‘qualified’ what he had said by claiming that he had been calling for backing during the negotiations, not the vote itself. Chinny! Remember that Child Abuse Inquiry? You’ll need a long memory as it is coming up to its anniversary and what has happened? NHS is safe in his hands, anybody believe that tosh? Low cost housing being built so we no longer need Private landlords? Some chance! Real Jobs for people to be able to have some sense of security? That’s the last thing Dodgy and mates want! The entire manifesto will unravel like an onion but we seem to have a population who are unable to recognise what is going on. Gove/Morgan are clearly doing an excellent job. Still, when all else fails, just claim you have been ‘Misinterpreted’. Brilliant! This entry was posted in Comment, Conservative, Fraud, Loathsome, Overseas, Politics, Society, Tory and tagged Cameron, Dave Cameron, David Cameron, Dodgy Dave, EU, referendum. Bookmark the permalink.